NEW!!!!! See bottom of page to purchase. Added identifier for currently loaded file. Manual Entry is added so you do not need to own a MAG-ic Probe unit in order to use the PRO software. Now you can save Master files of your repeated Instruments - Outline, Cutouts and Pre-Mapped measuring locations can be saved in a Master File. 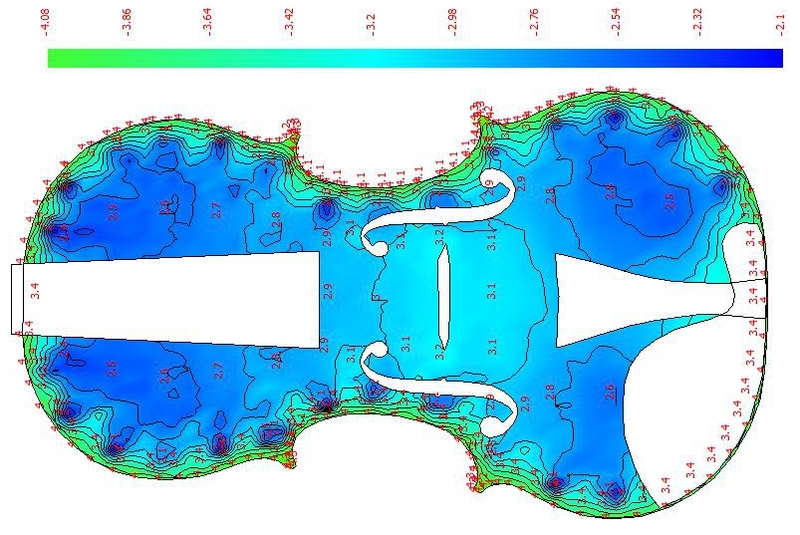 Then when you are measuring a new instrument, simply load the saved file and start measuring. MAG-ic Probe PRO version software allows you to document, archive and visualize your instruments like never before. MAG-ic probe PRO offers all the great features of the Lite version, but goes much further, allowing a fully customizable color contoured representation of your instrument. You can define your own color combinations and grid properties. MAG-ic Probe is the only software available that allows you to automatically capture measurements taken from your measuring instrument directly to your computer and record those measurements on an image of the actual instrument or object being measured. 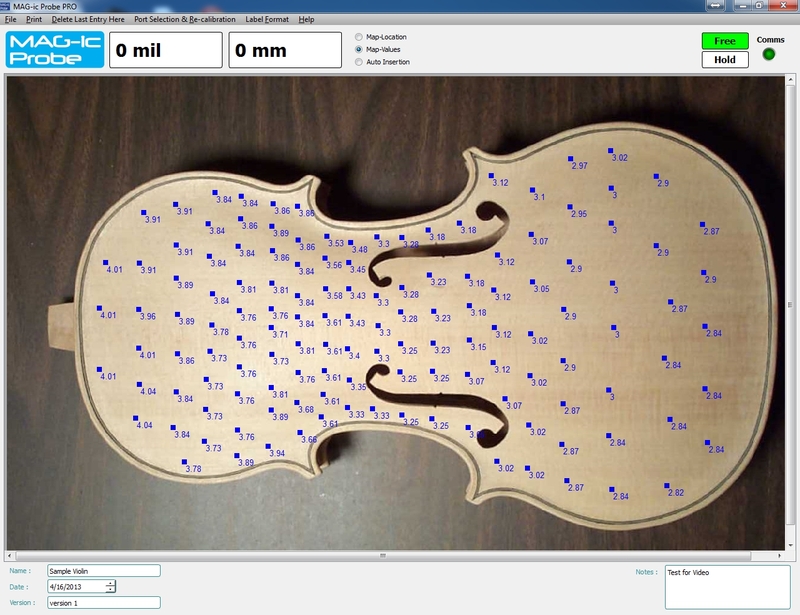 Now you have the ability to visualize the instrument in full color instead of just comparing numbers. You can see the high and low spots of your work and how they blend to each other. Compare 2 or more instruments visually without deciphering the numbers. DEMO VERSION - If you would like to try a demo version first, please go to the DEMO version on the Software Product page. The full version cannot be returned once a License key has been issued so please try out the Demo version first. A full video tutorial on the software can be viewed here. MAG-ic Probe PRO Tutorial 1 - Connecting the Device. 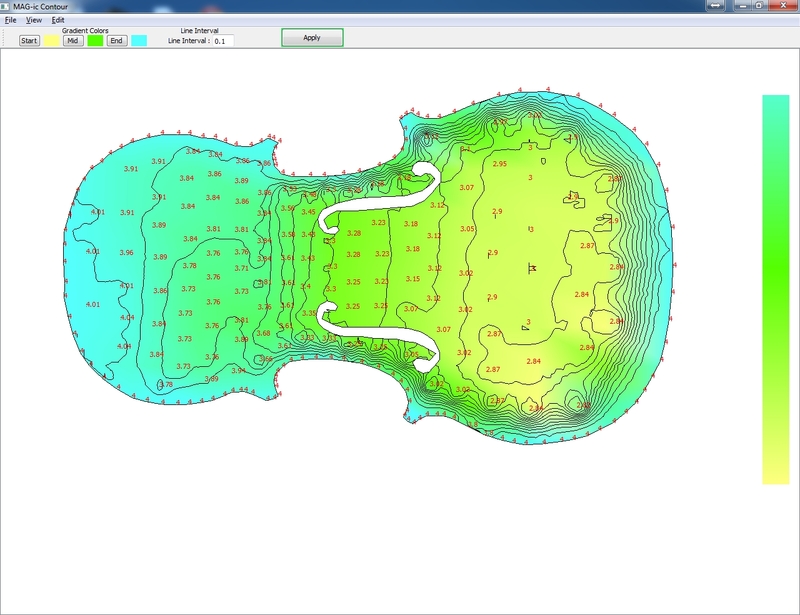 Used in conjunction with the MagicProbe unit, this is a great software tool for mapping the thickness profile of a guitar soundboard - I use it to accurately thickness my classical guitar tops, and the colour contour map it produces is very useful in showing me where to work on the soundboard to achieve the desired thickness. Overall, a very useful addition to the guitar maker's toolset. MAG-ic probe pro is a product of the best. MAG-ic probe pro is a product of the best.The magnetic force of the magnet is also the best. An easy-to-use software in particular, visualization of color-coded is the best.Correspondence with e-mail as early, it was also very kind to change. Thank you all! Click the button below to add the MAG-ic Probe PRO Software for Windows. to your wish list.